Security Misconfiguration is simply defined as failing to implement all the security controls for a server or web application, or implementing the security controls, but doing so with errors. What a company thought of as a safe environment actually has dangerous gaps or mistakes that leave the organization open to risk. According to the OWASP top 10, this type of misconfiguration is number 6 on the list of critical web application security risks. How Do I Know if I Have a Security Misconfiguration, and What Could It Be? The truth is, you probably do have misconfigurations in your security, as this is a widespread problem, and can happen at any level of the application stack. Some of the most common misconfigurations in traditional data centers include default configurations that have never been changed and remain insecure, incomplete configurations that were intended to be temporary, and wrong assumptions about the application expected network behaviour and connectivity requirements. Unnecessary administration ports that are open for an application. These expose the application to remote attacks. Outbound connections to various internet services. These could reveal unwanted behavior of the application in a critical environment. Legacy applications that are trying to communicate with applications that do not exist anymore. Attackers could mimic these applications to establish a connection. While security misconfiguration in traditional data centers put companies at risk of unauthorized access to application resources, data exposure and in-organization threats, the advent of the cloud has increased the threat landscape exponentially. It comes as no surprise that “2017 saw an incredible 424 percent increase in records breached through misconfigurations in cloud servers” according to a recent report by IBM. This kind of cloud security misconfiguration accounted for almost 70% of the overall compromised data records that year. One element to consider in a hybrid environment is the use of public cloud services, third party services, and applications that are hosted in different infrastructure. Unauthorized application access, both from external sources or internal applications or legacy applications can open a business up to a large amount of risk. Firewalls can often suffer from misconfiguration, with policies left dangerously loose and permissive, providing a large amount of exposure to the network. In many cases, production environments are not firewalled from development environments, or firewalls are not used to enforce least privilege where it could be most beneficial. Private servers with third-party vendors or software can lack visibility or an understanding of shared responsibility, often resulting in misconfiguration. One example is the 2018 Exactis breach, where 340 million records were exposed, affecting more than 21 million companies. Exactis were responsible for their data, despite the fact that they use standard and commonly used Elasticsearch infrastructure as their database. Critically, they failed to implement any access control to manage this shared responsibility. With so much complexity in a heterogeneous environment, and human error often responsible for misconfiguration that may well be outside of your control, how can you demystify errors and keep your business safe? Visibility is your new best friend when it comes to fighting security misconfiguration in a hybrid cloud environment. Your business needs to learn the behavior of its applications, focusing in on each critical asset and its behavior. To do this, you need an accurate, real-time map of your entire ecosystem, which shows you communication and flows across your data center environment, whether that’s on premises, bare metal, hybrid cloud, or using containers and microservices. 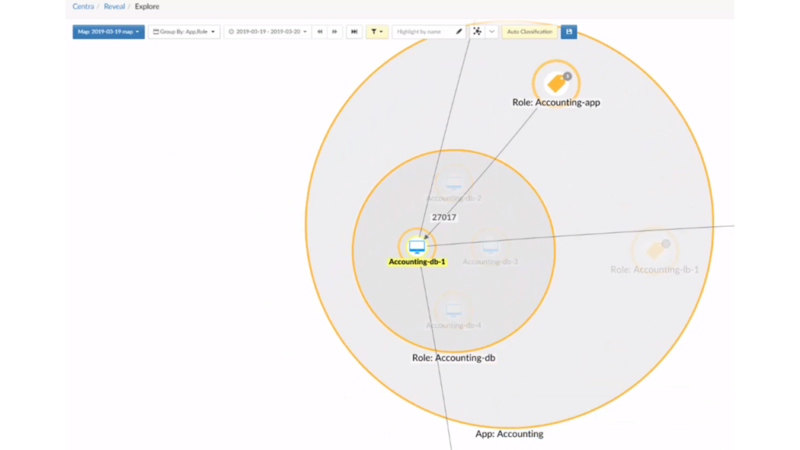 This visibility not only helps you learn more about expected application behaviors, it also allows you to identify potential misconfigurations at a glance. An example could be revealing repeated connection failures from one specific application. On exploration, you may uncover that it is attempting to connect to a legacy application that is no longer in use. Without a real-time map into communications and flows, this could well have been the cause of a breach, where malware imitated the abandoned application to extract data or expose application behaviors. With foundational visibility, you can use this information to remove any disused or unnecessary applications or features. Once you gain visibility, and you have a thorough understanding of your entire environment, the best way to manage risk is to lock down the most critical infrastructure, allowing only desired behavior, in a similar method to a zero-trust model. Any communication which is not necessary for an application should be blocked. This is what OWASP calls a ‘segmented application architecture’ and is their recommendation for protecting yourself against security misconfiguration. Micro-segmentation is an effective way to make this happen. Strict policy protects communication to the most sensitive applications and therefore its information, so that even if a breach happens due to security misconfiguration, attackers cannot pivot to the most critical areas. The chances are, your business is already plagued by security misconfiguration. Complex and dynamic data centers are only increasing the risk of human error, as we add third-party services, external vendors, and public cloud management to our business ecosystems. Guardicore Centra provides an accurate and detailed map of your hybrid-cloud data center as an important first step, enabling you to automatically identify unusual behavior and remove or mitigate unpatched features and applications, as well as identify anomalies in communication. Once you’ve revealed your critical assets, you can then use micro-segmentation policy to ensure you are protected in case of a breach, limiting the attack surface if misconfigurations go unresolved, or if patch management is delayed on-premises or by external vendors. This all in one solution of visibility, breach detection and response is a powerful tool to protect your hybrid-cloud environment against security misconfiguration, and to amp up your security posture as a whole.